Don't let the short measurements of the Yes 420 Snowboard scare you away. This board makes up for its lack of length with sheer, wide-footprint volume. This powder beast has a huge surface area to turn your average powder day into a day to remember. Take it from us, there is nothing better than actually "surfing" pow. Especially good for tree runs due to its reduced swing weight the Yes 420 Snowboard will certainly offer the spiritual awakening you've been seeking. PowRock – Extended rocker on the nose for float, flat underfoot, and rocker in the tail. Radial Tapered – Inspired by Steve Lis, and 420 the revolution that occurred when kneeboards influenced surfboard design. Powder is all about speed and flotation. Displacement of a board’s volume is affected by more than just length. With the 420 for example, we’re able to get the stability and float normally associated with much longer boards by punching out the waist width and drastically chopping the length. The 148 for example has the same circumference and base surface as a traditional 160, but it’s mass is located much closer to your feet resulting in more maneuverability and far less swing weight A slight taper (12mm) helps keep the nose up without loosing the tail’s ability to hold in hard-pack. Stance is only slightly set back from center of effective edge because the difference in nose and tail shovel keeps you from going over the nose. Weightless Core – The Weightless Core strikes a critical balance between light weight and strength. Using a lower density species of Poplar in areas that are not as structured and Paulownia in the areas that are, Yes. was able to shave precious weight. This helps the board not only float, but "feel" floaty. Triax – Robust torsional flex. Sintered Spec – This is the term we use and is the grey zone many companies play in. We call it Sintered Spec because it’s hardness and chemical properties are very close to true sintered and it’s on-snow performance is also very close to true sintered - but it’s formed using the extrusion process. How? – Well the raw material is actually pre- consumer recycled (meaning it never left the factory) sintered base material. So while the heating and extrusion process has softened it slightly, it’s still much harder than true Extruded. Rocker/Flat/RockerRocker/Flat/Rocker is another variation on the rocker theme that seeks to provide a little more hard snow edgehold and pop than full rocker while retaining ease of turning and float. Performance is between a fully rockered board and a flat board. 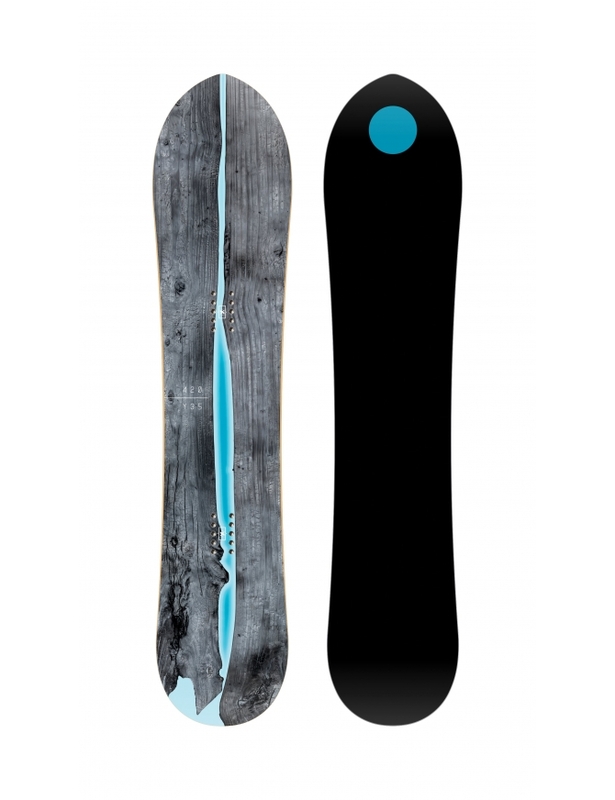 MediumThe amount a snowboard flexes varies significantly between boards. Snowboard flex ratings are not necessarily standardized across manufacturers, so the flex may vary from brand to brand. Many manufacturers will give a number rating ranging from 1-10, 1 being softest and 10 being stiffest. Here at evo we have standardized the manufacturers' number ratings to a feel rating ranging from soft to very stiff. Generally you will find flex ratings of 1-2 as soft, 3-5 as medium, 6-8 as stiff, and 9-10 as very stiff. Flex ratings and feel may ultimately vary from snowboard to snowboard. Advanced-ExpertWhether you charge the steepest lines, hit the biggest jumps in the park or carve with race-like precision, advanced to expert level skis, snowboards, boots and bindings are for the more aggressive rider. In skis and snowboards, you'll often find layers of metal, carbon or other stringers for rigidity and power, while advanced to expert level boots and bindings are usually on the stiffer side of the spectrum for rebound and precision steering. PowderPowder snowboards love powder. Often associated with freeride snowboards, powder boards sometimes feature a wider nose and a tapered narrower tail. The binding inserts, which determine the rider's stance, are often set back on a powder snowboard to help the rider float the tip of the board through the deep stuff. Powder snowboards sometimes also feature rocker, a design element where the tip (and tail) rise starts farther back on the board, which also helps the rider maintain tip float through the pow.